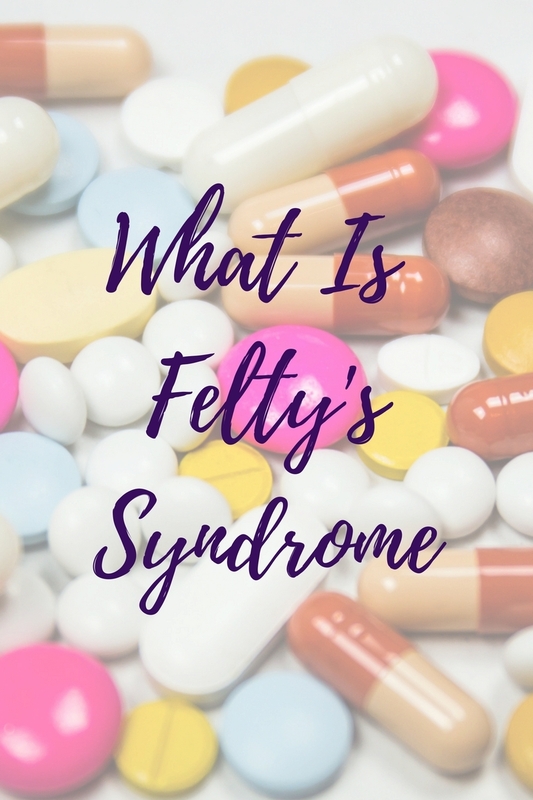 Home » Blog » OUR LIFE » MY STORIES » WHAT IS FELTY’S SYNDROME? Four years ago I was diagnosed with Felty’s Syndrome. I was sick for a long time before I finally received my diagnosis. At the time, I was being treated for a car accident that I had in 2009. I was sore all over my body, especially my left arm and neck and originally I was diagnosed with a strain. After I went back to work, I began to have even more problems. One day my feet would be sore and swollen and I would secretly take off my shoes to work. That was hard to do as a mail carrier. The next day my hand would be swollen or it might be my shoulders. I was then diagnosed with Fibromyalgia. I tried physical therapy, acupuncture, medicines etc. but nothing seemed to work. It got so bad that I was no longer able to work at a job that I loved. I couldn’t drive because I could not my raise my left arm and I become extremely dizzy when I had to look over my shoulder. I was under the doctor’s care, but it seemed that I was only getting worse. I finally gave up and for over a year and a half I was pretty much bed-ridden. I remember one night I was home alone and I had fallen out of bed and I was unable to get myself up. I laid there crying and struggling and somehow my dog made it in between the nightstand and the bed and “helped” me get up. It was amazing and something I’ll never forget. I lost him just two months later in an accident. Things were happening in my life that was very stressful: my son was serving in Afghanistan, my husband’s business closed, my daughter graduating from high school, and both of my children getting married. Everyone kept telling me I had “to fight this” and I don’t know how many times I heard that it was “all in my head”. All I know was I that felt very sick. I couldn’t eat, my stomach was so swollen. I quit having bowel movements. I went on this way for so long that I honestly felt that I was dying. My husband finally talked me into going to the ER to see what they could find. They ran lots of tests my blood counts had bottomed out. I don’t remember a whole lot of what happened at first. I remember a doctor telling me I was very sick and that if I had waited another two hours I would have died. I was given three blood transfusions and put into the ICU Unit for two weeks while they ran, as they explained to my husband, every test from A to Z. I had eleven doctors total. This is when I was diagnosed with RA and I first heard the words Felty’s syndrome, among other things even though it wasn’t completely explained to me then. My body had slowly been attacking itself killing off my white blood cells until it was almost too late. I admit I was just glad to hear that it was NOT all in my head. At first, the doctors didn’t think that I would survive, they called my family in. My siblings from SC and FL soon arrived. My son was stationed in Japan at the time and the Red Cross flew him home. I will always be thankful for that. As you can see, I did survive. I spent three and a half weeks in the hospital. When I was released we packed everything up and moved to SC to start a new life. My husband had a new job with medical insurance, even though I was considered pre-existing for the first year. My life is so very different now, it has to be. It is imperative that I stay healthy because my body can no longer fight off infections and that alone makes me more prone to getting them. My hands, feet, and legs are the worse and sometimes by late afternoon I can no longer walk across the room. My joints swell up, they become inflamed. For the last couple of months, it’s become quite an issue again. My counts are running at about a 1.4 when normal is 13.0 (that’s white blood cells). I’m on heavy doses of steroids trying to pump them up some while I wait for another round of Infusion Drugs to be administered on the 9th. We’ll see how well that works. One thing I have learned is that it could always be worse. I’m very lucky to have found great Dr’s who not only saved my life, but have kept me functioning relatively well these last 4 years. I can’t run a marathon or mop a floor, I can’t lift heavy objects or open jars. But what I do have is an amazing life with a wonderful family who loves me no matter what and I do have the determination to fight through it as best I can and rest when I can’t. I have found that it is all in the way that you look at your life. If you see a world full of “I can’ts” then you’ll always be stuck right where you are at, but if you see a world full of “I can try’s” then you will move forward even if its just a little at a time. It took me quite a while to figure all of this out, but I am so glad I did. Your experience echoes what I went through before being diagnosed with dermatomyositis. So sorry you’ve been through that and for your ongoing issues. My mobility fluctuates quite a lot but I’m in remission at the moment and pred is down to 10mg daily and I’m also on cellcept. I had infusions of IVIF gor 5 years until I hd a flare and it started attacking my lungs and had 7 infusions of cyclophosphamide a form of chemo. All good since then…pretty good. You know what I mean. Wow Rowena you have been through so much! I really appreciate the link I read it and it is so interesting, I had never heard of this before. I go for the infusion of Rituxan in the morning. I did it last April as well and it worked for several months but I had to wait until now to do it again. I have also been considering having my spleen removed. In my case it often helps because that is where the white blood cells get trapped and die. It is something that I am going to speak with my Rheumatologist. My Dr. is actually retiring in July so I am to search for somebody else and I hate that. He’s an excellent Dr. but he’s in his 80’s. I’m going to look at this implant device some more. I hope your health will continue with it’s remission that is terrific and usually elusive! I really hope it stays that way. In the grand scheme of things I’m doing pretty good compared to a couple of years ago. Thanks so much for commenting and sharing that link! I have researched Rituxin and they were all set to give it to me but the chemo worked and I haven’t needed it. I know exercise helps me, which for me like you, can be problematic. I broke my foot due to ankle weakness just before Christmas which slowed me down. I just try and do a bit of walking. The exercise also reduces your risk of lung infections and if you use a pedometer, the results are even better. I did buy the pedometer but haven’t used it. Pneumonia is my greatest threat and I had a close call two years ago. I probably should wear a mask during winter and I have seen some fabric ones but that’s a big step. Much more confronting than wearing glasses out for the first time and I remember how awkward that was as a 13 year old! I did the Rituxan last year with great results so I am hoping for a repeat. I’ve been trying Yoga and walking myself when I am able and it does help a lot. Pneumonia is a big danger for me as well. I have had it three times in the last few years and I do wear a mask during cold and flu season but try to just stay at home most of the time. I recently started wearing glasses as well so I get that too and they are much better than a mask, it is quite embarassing but being in the hospital is worse. I hate the side-effects from all of the different medicines too! Most are worse than the symptoms from the Felty’s! I don’t take any narcotics that is a decision that I made several years ago and so far I’ve only had to use them a very few times when things get really bad and I never drink alcohol. I’m so happy to have met you too! It’s nice to know that someone gets it and understands what I am going through. I agree too that taking care of mom helps me to focus less on my own problems and I think it pushes me harder to stay healthy because I know how much she depends on me. I apologize if I should know this because I forget so much but do you have your own blog? I would love to check it out if you do! That device sounds terrific, I read it and I am going to do some more research on it. This infusion that I am having in the morning had great results last time so I am hoping that it works again. I really am not doing as the numbers might suggest. I am not feeling to bad just a little tired from all the activities this past weekend but it was worth it we all had a great time. You know the old saying “Everybody’s got something…” I am exactly where I am supposed to be. I remember your last post regarding this and thank you for bringing it to our attention again. So sorry you have to suffer like this and appreciate you and your attitude so very much. You are such a good friend who never complains while I whine and carry on. First, you NEVER whine! Oh believe me I whine sometimes but only hubby hears me. He is an amazing man and I know if it wasn’t for him I wouldn’t get anything done. He’s the heavy lifter. Joy you are one of the sweetest people I have ever met. I could be so much worse off than I am. I am happier now than I have ever been in my life. I am doing what I love, surrounded by my whole family. Life is give and take you can’t have everything. I wouldn’t change a thing. When I started this blogging I was so unhappy. I cried all the time it was pathetic. I have made so many friends and opened myself up and I’ve filled a void that I’ve been looking to fill my entire life. The expression “What doesn’t kill you, makes you stronger” is what ran through my mind as I was reading this post. Rena – you are truly super-woman. I have no idea how you accomplish as much as you do, and maintain such an amazing attitude. I am so very lucky to have your friendship – and your example to follow. Feel better soon!! That’s exactly it Susan. I have lost so many people in my life who were so much worse off than I am. I’ve watched my husband’s family be slaughtered by some of the most painful, debilitating cancers known to man. I watched my 41 year old brother in law slowly suffocate because of a tumor in his throat. What I am going through isn’t anything compared to that. I know that I am truly blessed. I am happier now than I have ever been in my entire 45 years and I’m not going to let anything take that away from me. Life is just getting fun! Wish the education on this didn’t have to come at the expense of your illness. Thank you for the information and all the best and positive to you as you keep this at bay. Thank you so much Elaine. I’m going to be just fine! Rena, this is one of the reasons why I love you so much! Even after all that you’ve gone through, you write “that it could always be worse”. Your positive attitude and strength are such an inspiration to me, and you were brought into my life at just the right time. I think of you every day and send positive, healing thoughts your way!!!! Lana you made me cry! One of the biggest blessings in my life is your friendship! I thank God every single day that you were brought into my life when you were. It is the friendships that I am able to enjoy now that I believe changed my life. I am so happy now, I look forward to every single day and it is because of people just like you in my life. I have no doubt that one of these days you and I will meet in-person and I can’t wait until then! It’s so weird how both of our lives have changed with this crazy blogging thing but isn’t it just amazing! You are the inspiration to me and you make me want to be a better person! You are a daily inspiration to the rest of us. How grateful I am that we met. Thinking of you! Oh Diane, I am so thankful for you and your wonderful friendship! You inspire me to be the best person I can possibly be and you put a smile on my face every single day! You are also one that I know in my heart that I will one day get to meet IRL and it will be a dream come true! I appreciate that so much Cathy. I keep those same thoughts about you and for you. I know your are suffering right now yourself. Take care of yourself dear friend! I too have Feltys Syndrome but with only mild RA symptoms. After taking many drugs and having infusions with no results I am now taking Cyclosporine and my blood counts are finally stable. You are very brave and your attitude is an inspiration. I have never heard of this syndrome, but then again it’s so rare that most people – not even your regular doctor – know about it, right? I’m always “glad” when symptoms finally get a name and a treatment so you’re not completely in the dark. With your positive attitude of “I can” and “I can try” you’ve come a long way, and you’ll continue to enjoy life! ???? It was terrific to finally have a diagnosis that’s for sure. I’ve even had Dr.s tell me it was all in my head! Wow. I don’t even really have words to say what I’m feeling. I’m just sending you hugs. Lots of hugs.